I haven’t seen the new Cohen Brothers Inside Llewyn Davis yet, but I will. The film is based on Dave Van Ronk, whose music I didn’t follow but as a lover of folk music and all things Bob Dylan, I have always been aware of him. I seem to recall seeing Van Ronk in concert, it was in Central Park, where during my youth they used to have miller or schaffer or dr pepper musical festivals where tickets were only a couple of bucks and it was a great way to spend summer night. I think he opened up for David Bromberg or Leon Redbone. I think he was also at the Fast Folk outdoor festival on the pier in the 1980s. Checking out any type of folk music in NYC you were bound to see Van Ronk and it was always like, Dave Van Ronk, I know the name. I never felt compelled to buy any of his music. His records were not exactly available at the Harmony Hut, Sam Goody’s or Discomat or other surburan music resources supporting emerging personal soundtrack. Anyway, with Van Ronk fever all the rage, I found this bit of journal of a Dave Van Ronk evening, which I’ve revised slightly here. It was originally a Dylan newsgroup posting, written after Van Ronk died of Colon Cancer. About two years ago, I went to this thing at the New School of Social Research in New York, it was Dave Van Ronk with this writer, whose identity i cannot recall, but was not Elijah Wald, who went on to write the biography, the Mayor of MacDougal street (I thought it was, but after emailing him he corrected me; although he did say that Dave did tell him that he did do this clas). Van Ronk did not look healthy, uncomfortable in a classroom setting, with maybe 100 people. Anyway, the panel discussion – it wasn’t a panel, it was just was Wald and Van Ronk, and I think it’s because other panel members were no-shows – was about that Anthology of American Folk, Harry Smith music thing, and Dave Van Ronk was saying how it technically was out of print for a while, but boot leg copies and what not had always been passed around, and they did stuff like played Penny’s Farm then Maggie’s Farm and there was a lot of glowing stuff about Dylan. Van Ronk told this one Dylan story that took place during the 80s, when they were sitting around his apartment talking about the old songs and Dylan was saying how there’s no more tradition, that folksingers or singer song writers didn’t play the old songs before writing new ones any more and Van Ronk told him that’s because of you, Bob. And, soon after, Bob game out with Good as I’ve been to you and later, World Gone Wrong. I also asked this question. It was about when I was growing up, while I liked folk music it was always political to me. It was the 60s folk boom records, like Pete Seeger and Joan Baez and Phil Ochs and Bob of course. It wasn’t until much later, there were these real weird songs of real people, that were evident on the Folk Anthology. I can’t remember how I phrased, although people told me it was an intelligent question and basically, why did the protest thing totally over-shadow folk music. It was funny. Dave cleared his throat. He said the first divisions were between secular and religious music, and that back in the 20s and such, that the anthology songs were being sung, but so were union songs. There wasn’t the division, and the fact was, that between Woody Guthrie and the Weavers, it was the protest songs that were selling. By the 1960s folk boom revival, the protest songs predominated, dovetailing with the social upheavals of the time. He also told a funny story I will never forget about meeting Mississippi John Hurt. Finger picking was the big thing and there was this anthology song that all the finger pickers, including Van Ronk, learned to pick from. So, when he met the bluesman, he was pretty old and so Van Ronk figured that his fingers were just slowed down which was why when he played the song it wasn’t quite the same. So after talking a bit, the bluesman says how everybody is picking too fast, loosing the subtlety of finger picking, and Dave says they were learning from this one cut so Mississippi laughed and says, they sped up the cut to fit into the wax, I think it might have been on a 78 originally, changed the key and everything. Anyway, so folkies were learning to pick from an artificial version of finger picking. It was a funny anecdote. The following sounds fragmentary, but Dave Van Ronk had a last record, appeared on Prairie Home Companion, right before he died he was getting some attention, the Mayor bio I believe was posthumously published. Gee, wasn’t there just a benefit concert, I think maybe Garth Hudson might have showed up, to pay for Dave’s medical care? Cancer can linger and linger and then take you real quick. Death don’t have no mercy indeed. Hard to conceive of a new York folk scene without Dave Van Ronk, who stayed around long, longer after it was gone. There was a real integrity to the guy. Anyway, I will always remember asking him that question. He was saving folk music from itself way back when and then in the 90s too and I have to wonder, anybody around who can still save it. Anyway, I remember not liking his last record that got at least NPR and folk music circle attention, it was jazz standards or something. 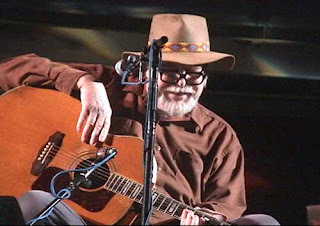 In addition to the Dylan connection, Van Ronk is directly responsible for Hot Tuna and Leon Redbone. I should pick up the new C.D.. Also, I realize I do have some Van Ronk. It’s a collection of Sea Faring Shanties, he sings Haul Along the Bowline. Folk music is also folklore, and just like union songs, sea faring songs fueled the tradition. By reviving a tradition, Dave Van Ronk not only became part of the tradition, he is now a new access point to that tradition. History is never past. 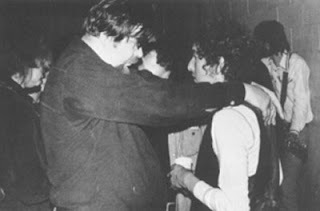 Dave Van Ronk with Bob Dylan backstage at the Phil Ochs Friends of Chile benefit in 1974. I always loved this picture, they both look so soused. I had a friend whose sister brought him to this show. I am still jealous. It was a benefit for Salvador Allende, who was soon assassinated. Ochs wanted the live record to revive his career, but the performers were so inebriated the tapes were deemed unusable. This concert was an attempt at reviving the folk music revival of the early 60s, and was a brief political cause celeb – one of the first, post-Vietnam, Post-Civil Rights – supporting a freely elected socialist. Tragedy all around, and when the next year Dylan attempted a more successful revival of the folk music revival, The Rolling Thunder Review, Ochs and Van Ronk were not invited on that train.